Although it is written that it is strong, the magnetic force is weak and it will soon drop. This review is about item#48915386. It is used to improve equipment. 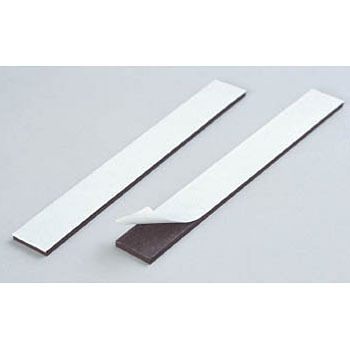 Since double-sided tape is attached from the beginning, it is easier to use than conventional products. I use it so that the gap does not become empty in relation to the door roller of the door. Although it is a little thick, I use it like a magnet stick to the SUS plate and the door. I bought it so that you can easily attach and remove acrylic boards. I could firmly fix with the strong magnetic tape as expected. Although it is used in the factory, we also wanted a thing that the posts were never to be flushed, because the winds and the workers also walked along the circumstances. It was good that the magnets were stronger than I imagined. Since there are a lot of heavy loads, it is easy to use as long as the magnetic force is up. Currently the sealers and the magnets are also strong! It is! In the magnet sheet, the fixed holding power was not enough and the material posted on the white board was frequently dropped. It seems that the magnet sheet itself is decreasing in magnetic force over time. After changing to this product, although there is some thickness, because it is super strong, it keeps the fixed state even when using only a small amount. Although the magnet is sufficiently strong and satisfactory, the adhesive tape is weak against heat, and it can not be used much in summer temperature (indoor), scenes that need to be used in combination with a commercially available strong double-sided tape also come out.